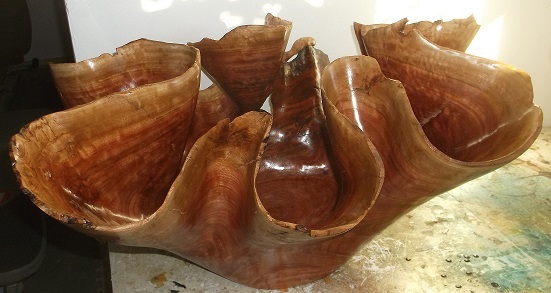 Carved from a very large Eucalyptus log to create this beautiful wavy bowl. 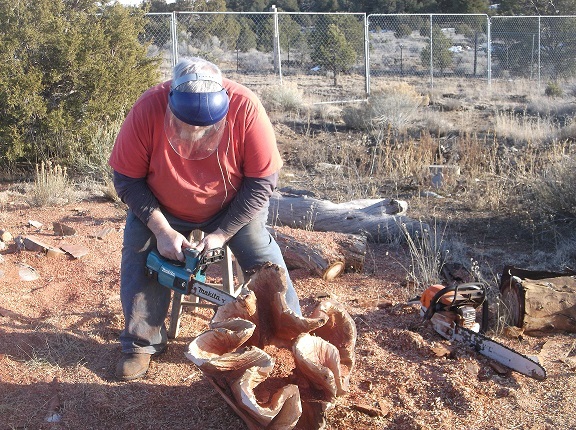 Scott first used the chainsaw to rough out the waves and folds. Then he used several different grinders to finish up the design and smooth it out. 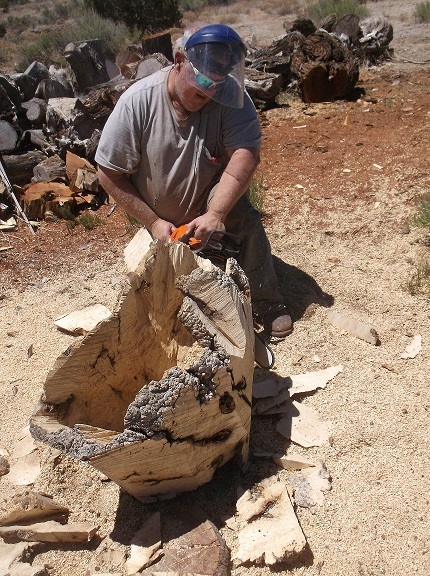 He wanted to show the age of the tree by carving into the ends of the log, showing all the growth rings. 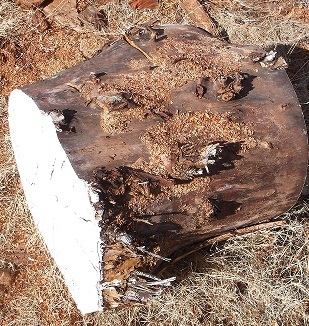 He was also careful to incorporate a branch that was protruding out of the log to add to the overall uniqueness of the sculpture. 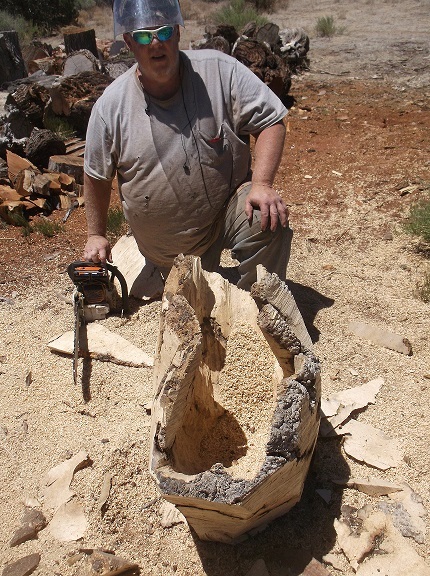 Eucalyptus is a very hard wood and takes more time to carve and sand. From start to finish this piece took about two weeks to complete. 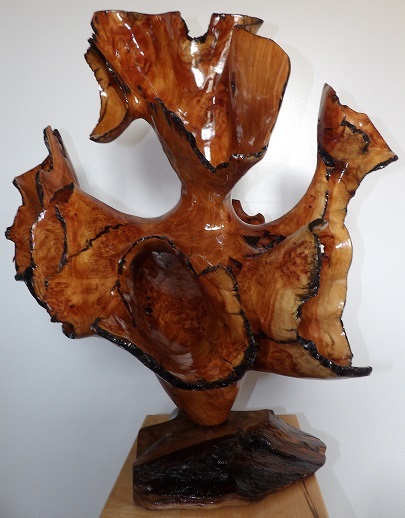 When the finish is finally applied it shows the incredible beauty of both the wood and Scott’s carving ability to bring that beauty out. 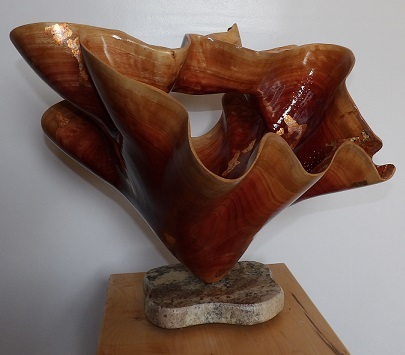 “RIPPLES IN TIME” and many other carved vessels and sculptures will be on exhibit this weekend, January 18-20 at the Carefree Fine Art and Wine Festival in Carefree AZ. If you’re in the area, stop by and see Scott and our booth and possibly take one home with you. 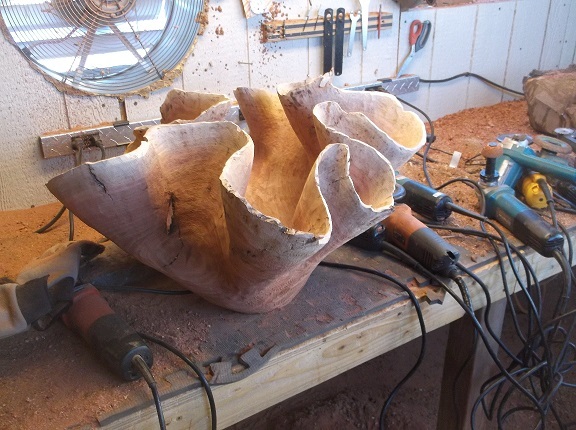 We have been busy creating new carved sculptures for our upcoming summer shows. 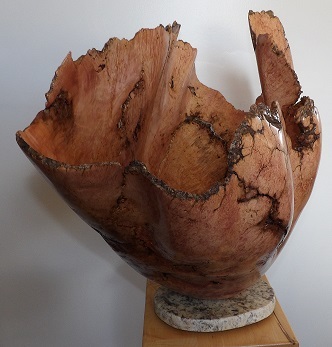 This weekend is Art on the Rockies in Edwards (Vail) Co. Scott has really outdone himself with these new pieces. Here are just a few of those. 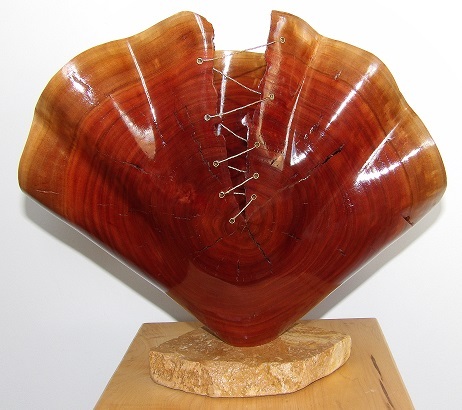 “STITCH OF GOLD” was carved from a Eucalyptus log and features gold jewelers wire in a crisscross pattern, stitched through the piece in a few places. 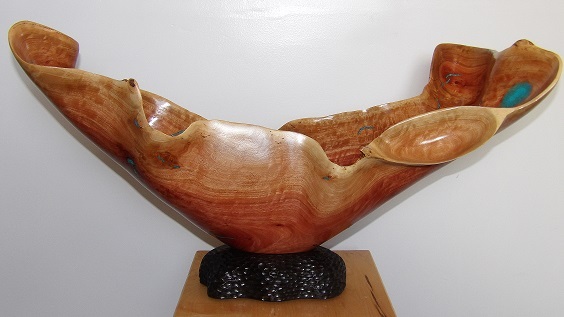 “GONDOLA” was also carved from a Eucalyptus log into this boat shaped vessel with turquoise inlay. 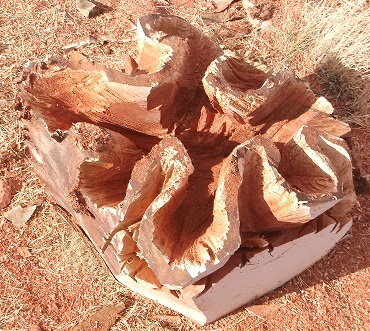 “STRIKE 3” is three tunnels carved into a Mesquite log with the outside textured. 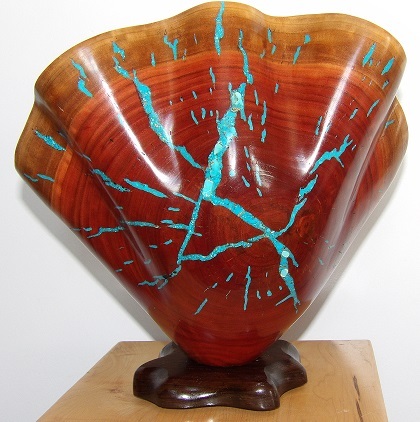 “SUNRISE CANYON” is a Eucalyptus canyon shaped vessel that has slight waves carved into it and turquoise inlay. 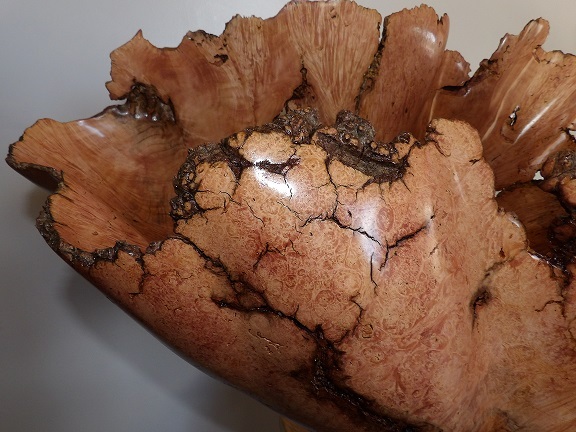 “COSMOS” is a tunnel design carved out of Eucalyptus with Red Opal inlay, gold leafing and texturing. 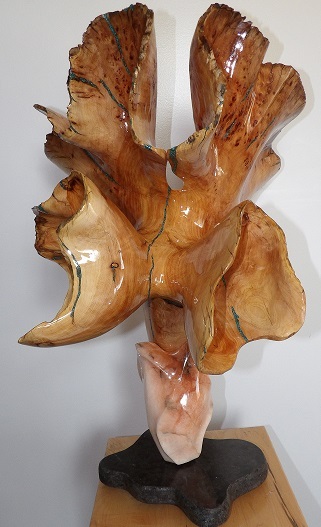 “FLOURISHING” is an incredible sculpture. 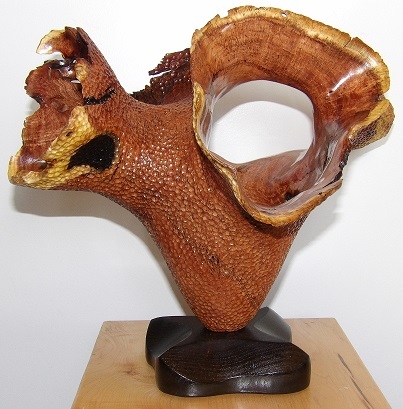 The wood is Alligator Juniper Burl that is approximately 700 years old. The design resembles a large flower with two small buds. 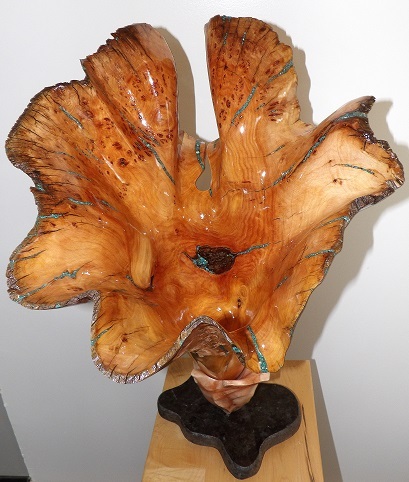 It has waves and folds carved into it, along with Chrysocolla inlay. The base is black granite with carved peach alabaster. “OLD SOUL” is one of those sculptures that only comes around once. 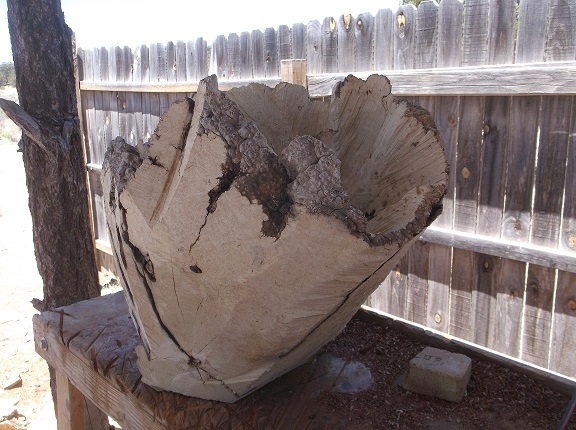 It was carved from an approximately 900 year old Alligator Juniper. 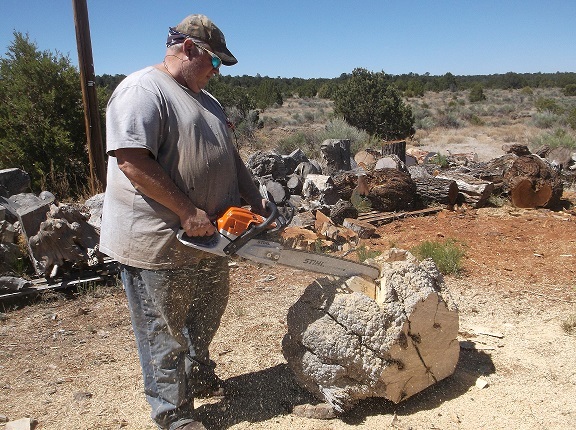 The size of the burl is a rare find. Several tunnels were carved into it that join in the middle. 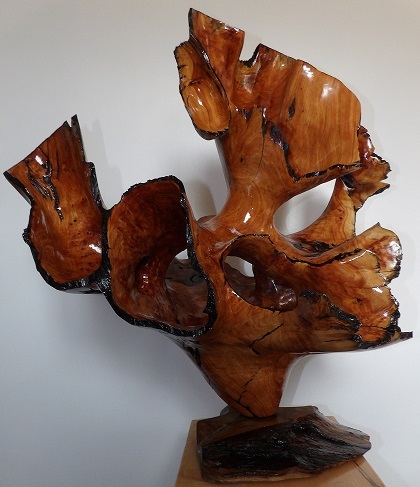 It features waves and folds at the openings and much of the natural aspects of the burl were left in place adding to the beauty. Creating a Masterpiece such as this can be a challenge. 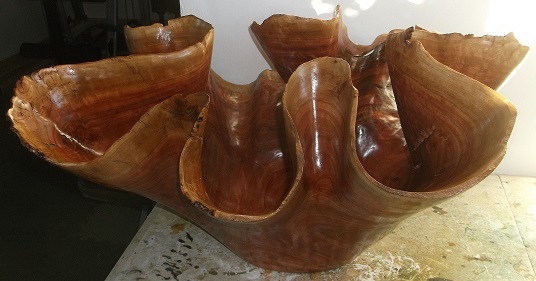 However, some pieces turn out so beautifully you forget about all the challenges that occur during the creation process. 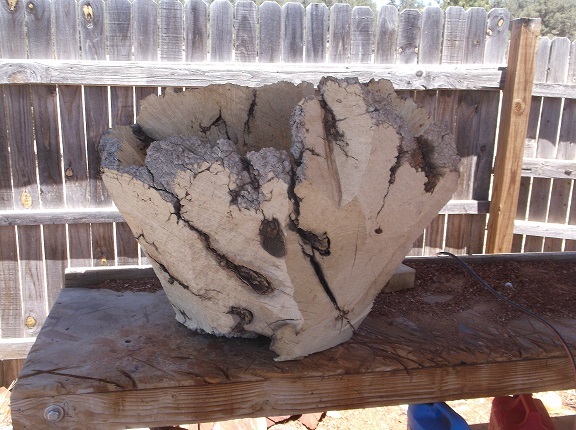 This sculpture started out as a very large Box Elder Burl from the Ruidoso area. 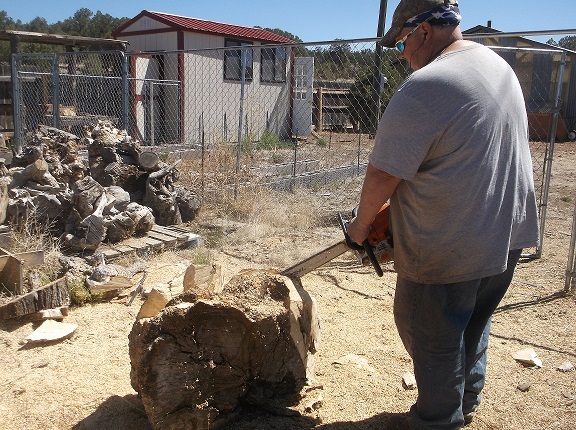 We dragged several of these beasts with us when we moved here to Candy Kitchen back in 2009. At the time we asked ourselves why are we lugging these all that way and what are we going to do with them. 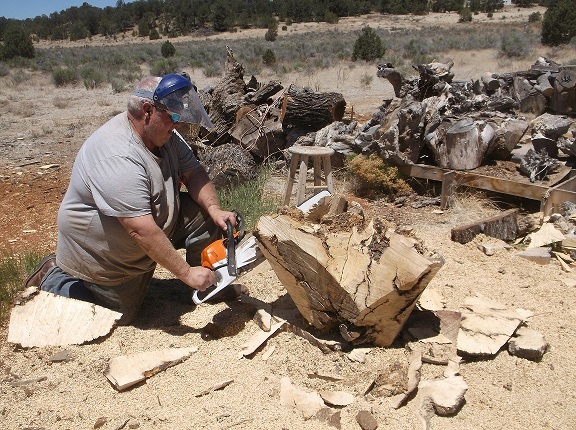 Well they sat and sat for years out in our wood pile area, till finally one day Scott decided to tackle one. 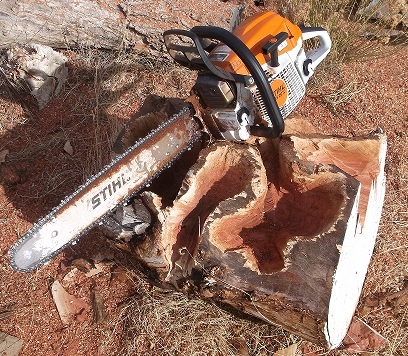 It was no small feat and during the whole process we asked ourselves why we were even working with this wood. It’s very hard, has tons and tons of holes, cracks, voids and narly pointy things and the beautiful white doesn’t stay that way once the finish was applied. 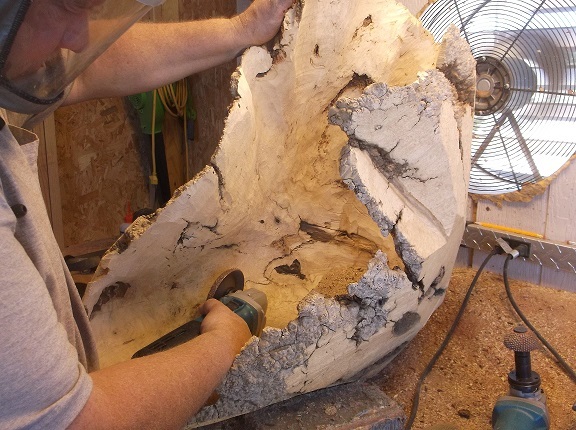 But as we continued to work with it and found a finish that makes the burl and grain really pop out better, we began to appreciate it more. Of course that was after it was all finished and we saw the final product that the appreciation happened. Our customers that add one of these to their art collection really appreciate them and everyone raves about how beautiful they are. They are definitely big attractions at the shows. 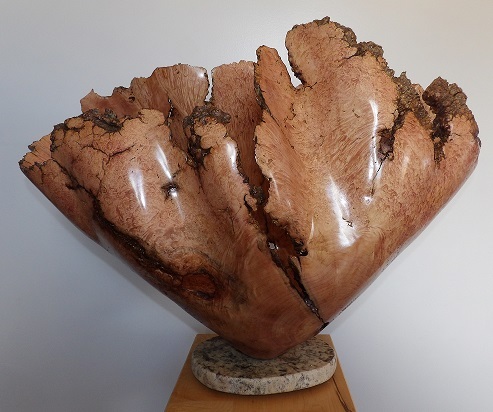 So now that we are down to are last remaining burls of this, we are going to really miss it and wishing we could get more. 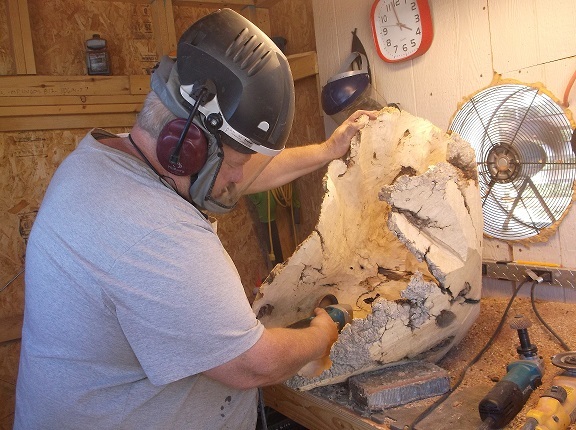 Below are photos of the process of one of the biggest sculptures we have carved out of this Box Elder Burl. We hope you enjoy seeing it morph into the Masterpiece that it truly is and perhaps even want to add it to your art collection. Now it’s up to the grinders to do their hard work. Or should I say Scott do the hard work. 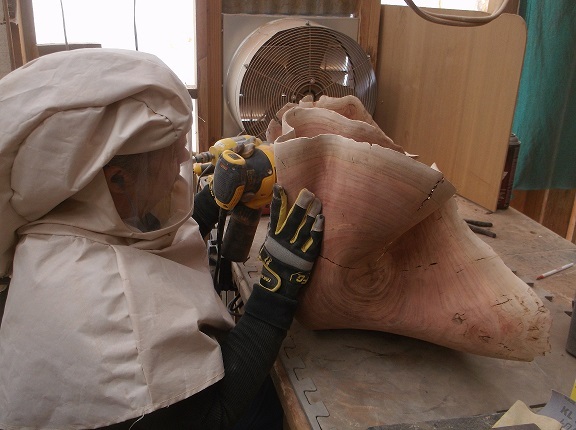 Lastly it’s my turn to take over the sanding and finishing. Talk about going through sand paper. 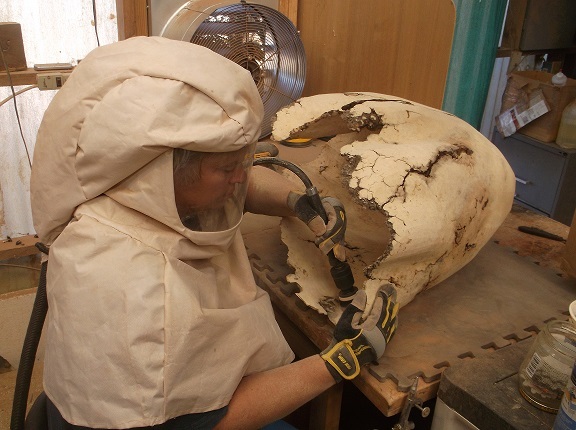 Between how hard it is and how all the holes and voids tear up the sand paper it takes quite some time. And now for the grand finale. Introducing “KINGS CROWN”. Look at this beauty all finished up. Close up of the grain showing how incredible it is.